You have probably seen this phrase a few times in your search engine results (as IoT) or heard the term from your IT team at the office. The Internet of Things has made just about every ‘Trend of 2016’ list out there and crosses industry lines in its usefulness. The definition of Internet of Things can be derived from its name. It is the concept of using the internet to connect ‘things’. Anything can become ‘smart’ through the use of IoT. You may already be receiving messages from your refrigerator telling you to replace the water filter tomorrow. The surprise cold-front that came in this morning is no problem because you can turn the heater up for Rover, via your Nest thermostat, from where ever you are. While the initial thought process was connecting individuals’ ‘things’, the IoT is changing the way the manufacturing and industrial industries are conducting business. The addition of sensor technology to IoT in these business sectors has revolutionized how a business can operate. Processes and systems can now update each other. Inventory can order itself through an integrated ERP system. For example, you manufacture carburetors and need to maintain 3:1 ratio of manifolds to throttle solenoids per carburetor built, with a projected manufacture rate of 47 completed carburetors per day. Using sensor technology and IoT with your ERP system, your manifold inventory can track your throttle solenoid inventory and automatically order additional raw materials needed to maintain the optimal level of production for your assembly. 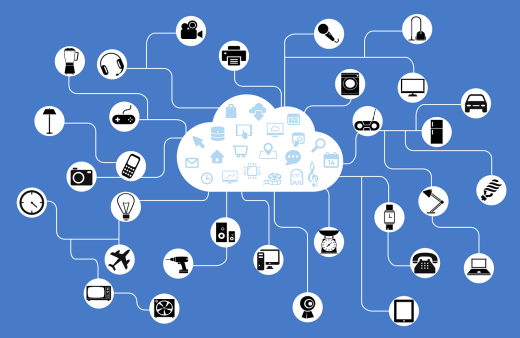 The Internet of Things connects ‘smart machines’ seamlessly. As you can see, a key component to the Internet of Things is an ERP system that can adapt to systems and processes that change quickly with the needs of their customers. When you really break it down, an ERP system is a massive collection of data. Whether it be contact management, inventory or the general ledger, it is an accumulation of information that your business needs to operate efficiently and to provide a service or product that customers need. The IoT has the ability to assist in the gathering of this data, creating an operation that allows the human element to take a step back from data collection and become a more prominent force in the analysis of that data. Therefore, the IoT provides your ERP system with even more data to incorporate into informed decisions. Carillon®ERP is already a limitless system. You are not limited in the number of contacts, addresses, inventory items, sub ledgers, sales orders, the list goes on. Because the Carillon®ERP system is fully integrated, meaning no third party add-ons, you only have one product to monitor and have open on your computer screen. The technology of IoT is still relatively new but the implication of its possibilities cannot be ignored. Regardless of the new uses that arise from a sensor technology and IoT partnership, Carillon®ERP is ready to help your business integrate ‘smart machines’ to your operation. Call today for your customized demo!